The jaret calendar is an eclipse plugin using the jaret timebars showing a google(tm) calendar synchronized to the local eclipse or rcp. 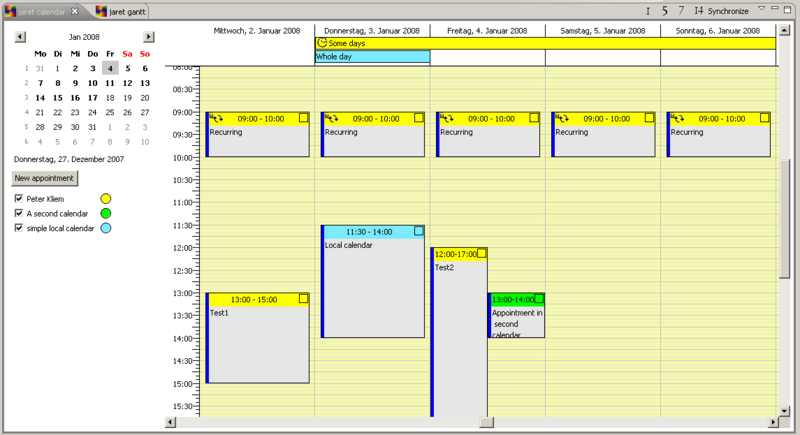 An additional view shows a classical gantt view of the configured calendars and (optional) of mylyn tasks present. Additionally a very simple locally saved calendar is shown. If you like you can comment and rate the jaret calendar at Eclipse Plugin Central. The development is experiemental (reflected by the version number!) This program is distributed in the hope that it will be useful, but WITHOUT ANY WARRANTY; without even the implied warranty of MERCHANTABILITY or FITNESS FOR A PARTICULAR PURPOSE. The plugin is tested, but there is no guarantee that your calendar data will not be harmed! If you use the plugin you do so on your own risk! It is not sure whether this plugin gets *really* completed. It is published in the hope that it might be useful for someone in some sense. If someone is interested in contributing to the development: contact me at peter.kliem@jaret.de. You might also report bugs to this mail adress. The jaret calendar plugin itself contributes two extension points for defining calendar providers and gantt providers. The google calendar provider acts as a calendar provider and a gantt provider while the mylyn adapter (see below) is a gantt provider only. 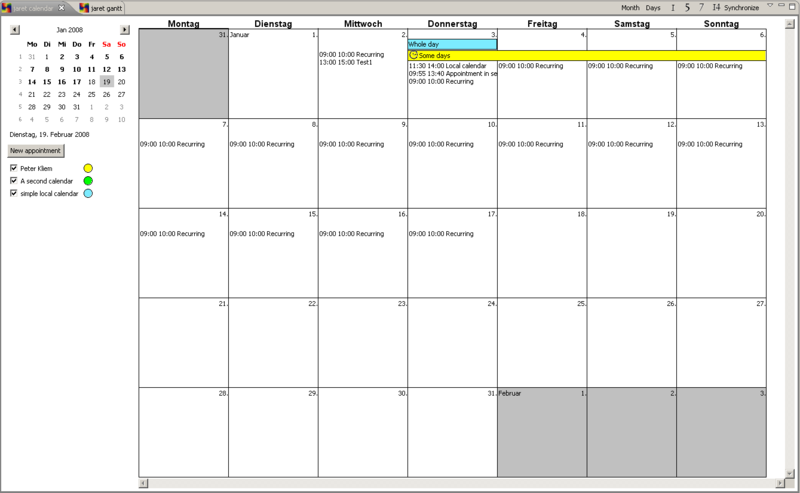 The simple local calender is a calendar and gantt provider with a simple local storage. The plugin has been developed using eclipse 3.3 and Mylyn 2.1. It has been tested on Win XP only, but should work on other platforms as well. The google client APIs do need the activation framework for java. This is included in the base JDK since Java 6. So the prerequisite to use the plugin is either using Java 6 or downloading the activation framework (http://java.sun.com/products/javabeans/jaf/downloads/index.html), wrap it as a plugin and add the dependencies for the gdata plugin (basically this means: build it yourself from source, chnage the prerequisites in the plugin). (It's far better to switch to Java 6 of course, if you can!) To install the plugin simply copy the contents of the supplied binary zip(s) in your eclipse plugin directory. After starting check the preferences for the jaret calendar and configure your google calendars. You get the feed url by looking at the properties of the calendar via it's web interface. Use the private feed URL. The link provided ends with "/basic" which you should alter to "/full". IMPORTANT: remove the magic token. This is the hexadecimal crap after "private" (".../private-156119a3ccaaea460390fc37a510846c/basic" -> ".../private/full"). Now you can open the jaret calendar view (--> open view). If you are behind a http proxy you might also want to check your general eclipse proxy settings! Please note that the preferences will be used once to build the connection. So the effect of changes becomes visible after restarting eclipse. 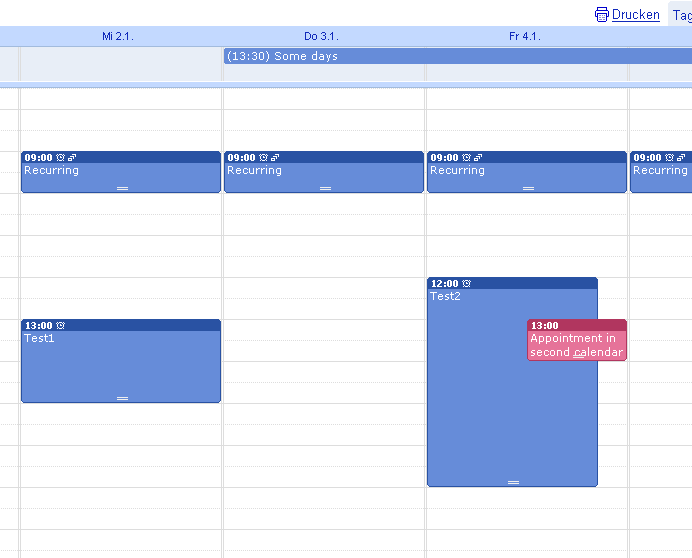 Changes made to appointments will be saved with the "synchronize" button in the toolbar of the calendar view. 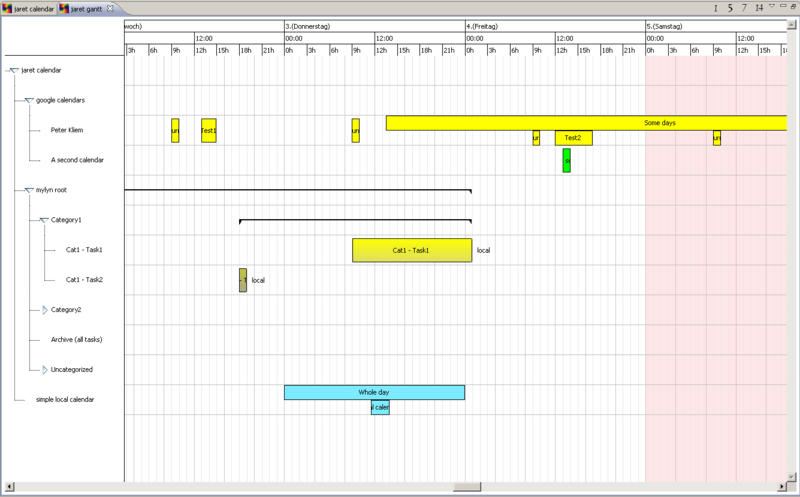 This will also save changes made to appointments in the gantt view. A synchronization will also be done when a date is selected in the calendar month panel. Compress non-working times: If activated the non working time will be scaled different from the working time. the sorting order of the tasks is *random*. Need to check how mylyn sorts the tasks and categories. de.jaret.calendar_0.0.2.zip Zip containing the base calendar plugin jars including the google calendar synchronizer ready build to be included in eclipse 3.3 (copy jars to the plugin directory). The source for the calendar plugins (base, gc, slc) is included. The source for the other components can be found at http://jaret.de. If you do not need the google calendar integration you can simply delete the de.jaret.calendar.gc JAR. de.jaret.calendar.mylyn_0.0.1.zip Zip containing the mylyn gantt provider for the jaret calendar (depends on the base). Source is included in the plugin.